Have players spaced apart and holding a pickle ball or any type of plastic ball. Call out either “high or low.” On the “high” command the player must throw the ball above the blue tape. On the “low” command the player must throw the ball below the blue tape. Notice the coach handing the ball to the player. Remember to separate skills so instead of the player catching the ball, hand it to him or have him pick it up himself. The coach can eventually progress to combining the skills. Coaches should have an ample number of balls. This is one of those drills that there has to be ample space between each player. This is a great drill for working on basic throwing techniques and accuracy. Coaches and parents should be encouraged to break up each skill at first, so a player will either throw or catch a ball. Bonus Tip: With regard to throwing a ball, young athletes can develop physically in this skill from ages 6 to 9. Coaches and parents should not get frustrated nor give up on their kid’s involvement in baseball or softball. If the player shows an enthusiasm for the game, stick with it! 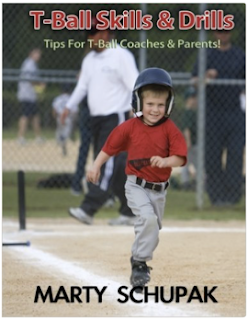 "The best t-ball drills I've ever seen with fundamental necessary tips."